Conflict. It’s what makes readers keep turning pages late into the night, and what helps writers know what to put on the page next. Some conflicts are fairly obvious: blizzards, runaway trains, or moustache-twirling villains are pretty easy to identify as the enemy. But what happens when your real enemy is . . . you? That’s what writers call internal conflict, and it can be subtle. As I read this month’s releases from Bethany House, I noticed that all of the main characters had a great story arc involving internal conflict. Yes, things are happening outside of them: a mistaken identity, hostage negotiation, impending murder, and blackmail. But what really drew me into the story were the unique and nuanced issues that each character faced. Here, the authors and I talk about the characters’ internal conflicts. To learn more about Judith and her books, go to judithmccoymiller.com. Judith’s Take: For several years Andrea Wilson faced the consequences of a bad choice. A choice that destroyed her trust. 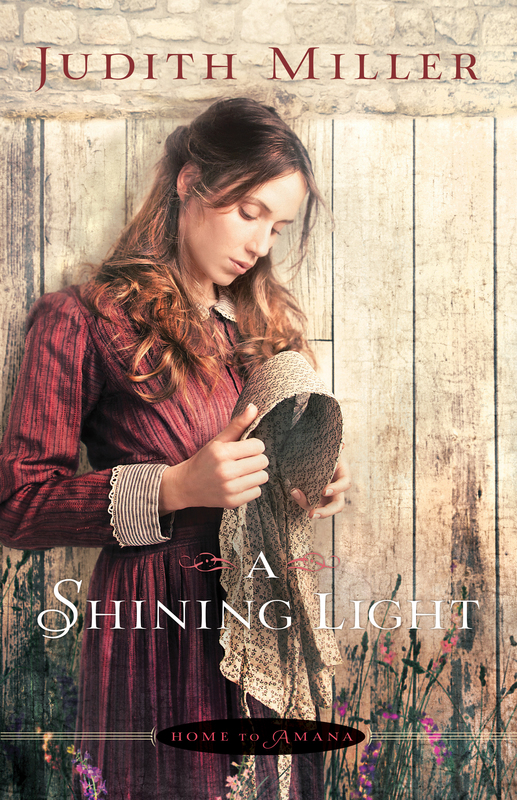 Now, unexpected events have thrust her into life among the Amana Colonists in Iowa. If she is to ever find the peace, safety, and love she desires, she must learn to trust God as well as the people who have given her shelter. When trust proves more difficult than she anticipated, she must decide if she will rely upon her own understanding or finally trust God. Well, here we are with the days of December barreling by at breakneck speed. In the spirit of the holiday, and since my last two book series have been set in the Amana Colonies, I thought I’d give you a little taste of Christmas in Amana. For those of you who might not know, the seven villages that comprise the Amana Colonies are located in Iowa, about fifteen miles south of Cedar Rapids. Visiting Amana is always fun, but going during any of their festivals is very special. Because Christmas is such a wondrous time of year, I think visiting during the Prelude for Christmas festival is the very best time. It’s an opportunity to walk candle-lit streets and turn back the pages of time. An added bonus is a chance to attend A Glimpse of Amana Past, where descendants of the early settlers dress in authentic Amana attire and present stories of Christmas celebrations from years ago. The people of Amana were very frugal and, in days gone by, thought it wasteful to cut down a tree for Christmas display. 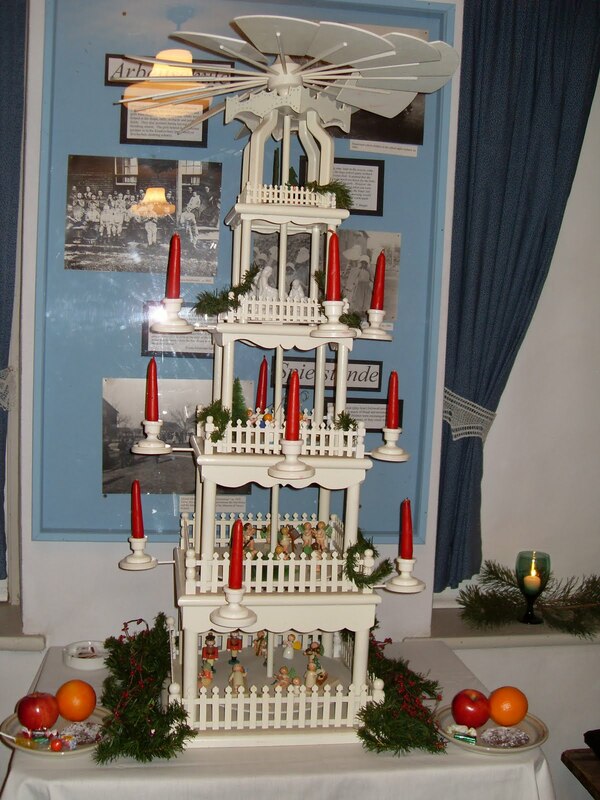 Some families used a Christmas pyramid that was carved by Vater or Opa. The pyramid on display at the museum, pictured below, is about two feet high. When the candles on the pyramid are lit, the heat causes the blades at the top to turn. Small figures, including nativity scenes, were placed inside the pyramid. You might even experience a visit from Pelznickle, the “Amana-German” version of St. Nicolas. He’s a bit scary, but if you’ve been good, he’ll give you some candy instead of a bundle of sticks. Christmas carols are sung in German, so brush up on your German if you care to join in with the group. Be sure to take a tour of the Tannebaum Forest in the Festhalle, where you’ll see lots of huge, decorated trees; go on the cookie walk; and take the Christmas Haus Tour, where you can visit with homeowners and gain insight into the history of their homes that are decorated for the holidays. Then return to the Amana Arts Guild for cider and cookies and take a look at the many handmade gifts you can purchase for family and friends! And, of course, leave time to visit the many wonderful stores throughout the village.